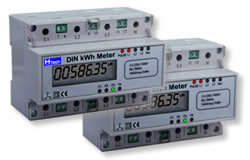 The electronic kwh meter is the latest development revenue meter. The meter has been designed to meet the modern standards of electrical utilities. High metering security is designed to against illegal abstraction and fraud. Protection from mechanical, magnetic or electrical interference is built into the products as an antifraud, the meter runs forward regardless of the energy direction. The high accuracy, wide operating range, and very low starting current makesit the ideal choice. The SMT (surface mount technology) design and construction guarantee a long and service free life. Beside the Kwh Meter is well protected against tropical conditions by means of a gasket seal located between the base and terminal cover. The energy register is of the well-proven digital type of LED, incorporating six digits. The design of the register ensures easy reading of the meter and permanent display. Automatic meter reading function is provided by its electronic pulse output or through optional RS485 (Modbus-rtu protocol) serial port connections. 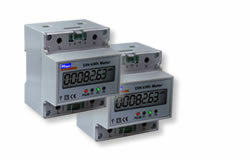 The register value is always maintained with meter's display or with electromechanical counter display.